Back in the news this week : oseltamivir (Tamiflu) in high demand as a last defence against the swine flu (aka Mexican flu). So time for an update on oseltamivir total synthesis (see previous post here). Yamatsugu et al. (DOI) start their synthesis (not the first one from this group) with an asymmetric Diels-Alder reaction between dimethyl fumarate 1 and siloxy diene 2 (accessible from crotonaldehyde) catalyzed by BINAP clone 3 dubbed F2-FuijCAPO, and barium isopropoxide. After hydrolysis of 4 , the resulting dicarboxylic acid is reacted with DPPA to diacyl azide 5 and this step is followed by Curtius rearrangement in tert-butanol yielding boc protected 6. Acylated hydroxy malononitrile is an acyl synthon which is added in an allylic substitution with Pd2(dba)3 and dppf. The double bond in 8 is converted to an epoxide (trifluoroperacetic acid[) in 9 and K2CO3/EtOH hydrolyses both this epoxide and the acetoxydicyanomethyl group in 10. The final steps are aziridination and introduction of the pentyloxy group. Ishikawa et al. (DOI) have come up with an amazing triple one-pot reaction. The first brew contains a organocatalytic Michael addition, an intramolecular HornerWardsworthEmmons reaction and some protective action. Step two consists of tert-butyl deprotection by TFA and azide placement (oxalyl chloride / sodium azide). 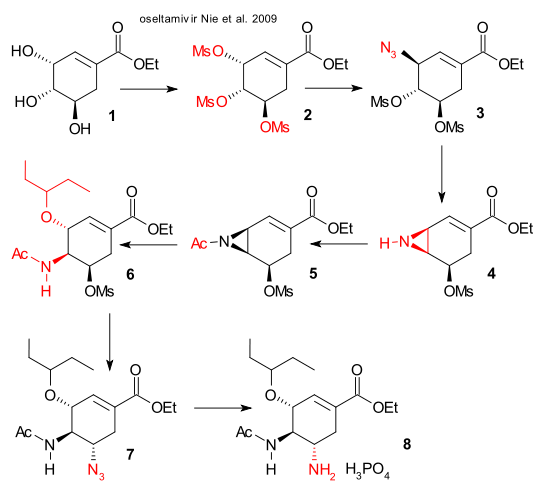 Step three is a Curtius rearrangement followed by acylation , zinc / ammonia reduction of the nitro group to the amine and retro Michael addition of the Stol group by potassium carbonate. The authors claim a 57% yield starting from the nitroalkene with cheap reagents and a minimum of workup. Nie et al. have reported both a 13-step synthesis (DOI) they were not happy about and then a shorter 7-step synthesis (DOI) both starting from shikimic acid (harvested from Chinese star anise 3.6% yield). The synthetic plans are very similar both using sodium azide (use discouraged due to hazardous nature). The 7-step plan starts from the ethyl ester of shikimic acid with all hydroxyl groups mesylated in step one. First substitution by NaN3 is followed by ring-closure to the aziridine. Acylation, ring re-opening by 3-pentanol and seconds azide attack take place next, concluded by Lindlar catalyst reduction. The authors claim 45% yield based on shikimic acid. Oshitari & Mandai produced a double-header with synthetic schemes for oseltamivir, one starting from L-Methionine (DOI) and another from D-mannitol (DOI). Too bad the journal they elected to have their work published in (Synlett) is utterly inaccessible.